Applikon RAMbio Microbial Culture Mixer Resonant Acoustic Oxygen Transfer . New Life Scientific, Inc. The RAMbio benchtop incubator uses Resonant Acoustic technology to get maximum performance from microbial cultures, thus replacing orbital shakers. 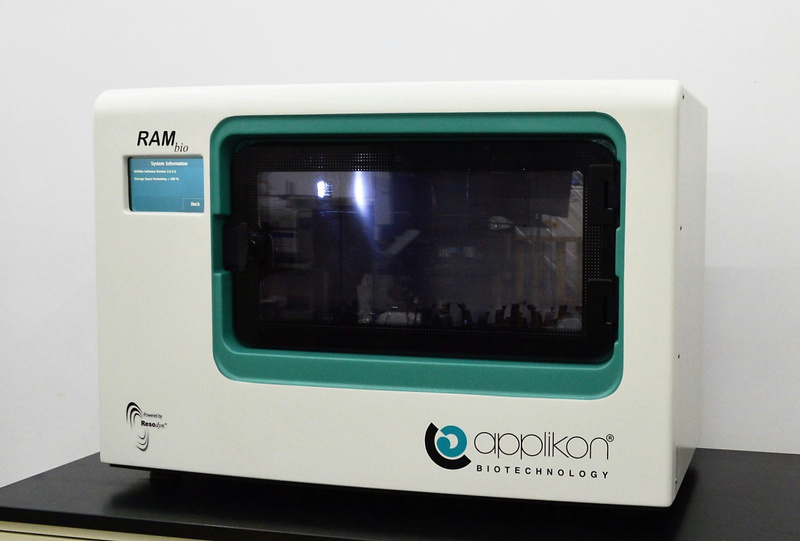 The Applikon RAMbio microbial incubator is in excellent cosmetic condition and functional condition. New Life Scientific technicians have evaluated the condition and functionality of this instrument, by powering it on, assessing any broken pieces, and confirming that it responds as a functional product. The technicians operated the instrument for more than an hour, noting the RAMbio called for more water to maintain the humidity setting. A number of the flask holder-arms were broken, but five holders were replaced and two additional arms will be included; there are three old holders that removed and included. There is a strobe feature that allows the user to observe the motion, the acoustic mixer functions, and the humidity control senses the RH; the technicians did not test the accuracy of the humidity control. Please contact New Life Scientific for more information about this listing and review the manufacturer's links provided for supplemental reading. *No Oxy-Pump stoppers or consumables are included with this listing.